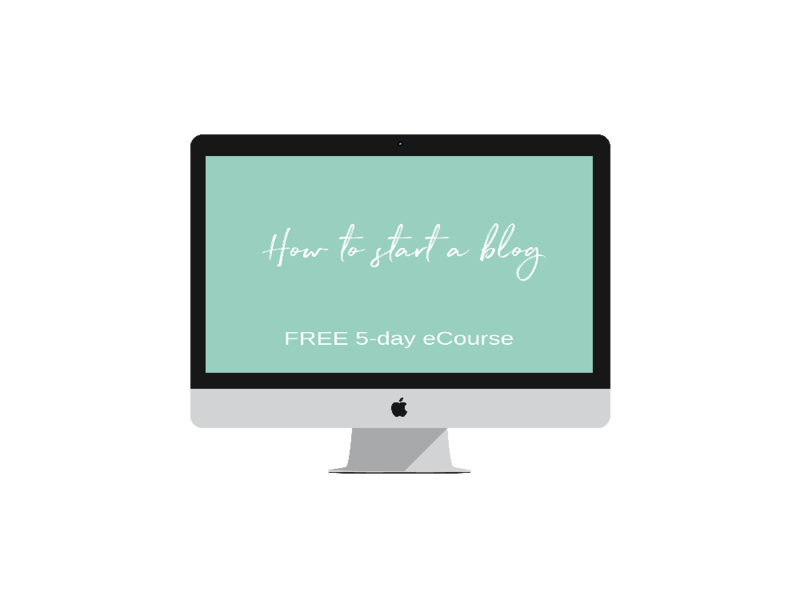 Learn all the basics about how to start a blog and build your online business from scratch! Instead of having an over-detailed explanation of every step to create your blog here you will get a comprehensive yet actionable walkthrough of the process. After completion of this post, you will have registered, installed, and configured your blog with basic settings and a professional look. This will be the foundation for any content on your blog to come! You will find other posts on this blog going deeper into certain topics. This post is intended to be a straight-forward step-by-step guide to get a professional blog. Thus I will not lay out several options on every step on the way for you, but provide you my recommended option with some explanation why I chose it. Therefore instead of wasting any more time connecting the dots of how to create a blog (because wasting time = wasting opportunity = wasting money) you could just read this one post, follow all the action steps and would leave with a blog at hand you can manage easily on your own. Okay, to be fair: quite easily. Though I put a lot of effort into this post to make it as easy as possible for you to create your own blog there will be many topics touched which might be new to you and need some time to implement. But if you are serious about your desire to have your own professional blog here you will find one of the quickest paths to create one. If you have trouble understanding a part, discover any mistakes or have any questions/feedback: Would love to read a comment about it so I can get back to you (or contact me)! And no without further delay: the step-by-step guide to your blog! This will be one of the few sections in this post where I explain some of the terms and concepts mentioned throughout this post. So the actual first actionable step will be step two – feel free to jump! I will make it as short as possible and use some metaphors to help you get a picture of the foundational terms concerning blog creation. Let’s start by saying your blog will be your “house” in the digital space called “internet”. As mentioned in my introduction this article is not about laying out all choices and going into detail comparing them. Instead, I want to help you to get quick but professional results without the need to overthink every one of the many decisions to make when starting a blog. That being said: It’s time to register a paid plan with your host to get your web space and a domain. As a host I recommend Siteground. 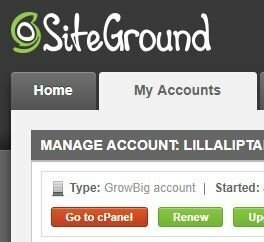 In this step, I will show you in detail how to register and set up your web space and domain with Siteground. There are other well-known players like Bluehost or GoDaddy, but again: this article is about actions and less about decisions. And in my opinion, you can not go wrong with either of these three and especially in the beginning, there is not much difference between them. To start go to Siteground. Do you plan to have more than one blog/site in the near future? If so, can you afford the “GrowBig” plan which is currently 5,95 $ / month (respectively 19,5 $ after your first invoice)? If you answered both questions with yes, go with the “GrowBig” plan. Otherwise, choose the “StartUp” plan for now. When your blog grows and you get more and more visitors there might be a point in time where you want to upgrade your plan, but both will do it in the beginning. To continue click the “GET PLAN” button on the plan you want. On the next screen, you can choose to either register a new domain (“post address”) with Siteground or enter an existing one. You might be able to find another host or domain seller where you can get your desired domain a little cheaper. Though in general, most times prices are pretty much the same. Thus to have all in one place I recommend to register a new domain with Siteground, too. The difficult part is to find a good name which is not yet taken. Finding a good name for a blog is an art of itself. There are plenty of different opinions out there and different guidelines on how to do it. Some examples: make it short, make it simple, should reflect what you are offering. When I started to think about names for my first blogs I got caught up in the name finding process. So many guidelines and when I thought I found a good name it broke a rule I read somewhere. In the end, I still believe a good name can do your blog business good and vice versa. However, there are so many other factors which determine your success. So now you have a name. Next decision to make: which top level domain? I recommend to go with a “com” top-level domain, but if your name is taken with a “com” ending, then try out “co”. And of course, you can still think of and try out another name. Why no other ending than “com” or “co”? You can choose another ending, but be careful: Over the last decade a lot new top-level domains have been introduced, so by not there are over 1500 top-level domains (though some are not available for everyone). However: Google mentioned in the past that the top-level domain will not affect how a site ranks within Google’s search results. But it might affect the perception of your site. Some endings are perceived by more people as shady or just unprofessional. Either because many shady sites are registering with these endings or simply because many people are not familiar with many of the new endings, yet. Also some endings are connected to countries respectively languages (e. G. “de” for German), types of institutions (e. G. “org” for non-profit organizations) or topics (e. G. “io” which stands officially for “Indian Ocean” but is now a popular top-level domain used by many tech startups). In the “Purchase Information” section: If you do not have a data center in the US preselected (as in the screenshot), I recommend to choose one in the US from the dropdown if your audience likely will be mainly from the US. 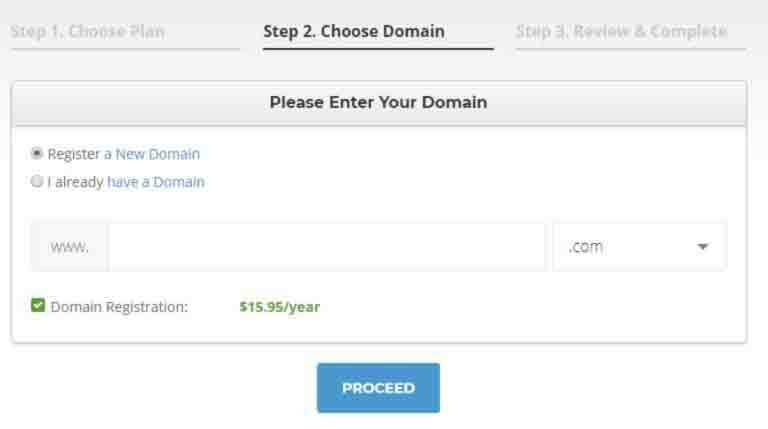 Domain Registration checkmark will be preselected if you chose to register a new domain with Siteground in the previous step. The “SG Site Scanner” is optional. I think it is not necessary. Therefore I did not chooose it myself and can not give you an impression of it how it would look like / work exactly. 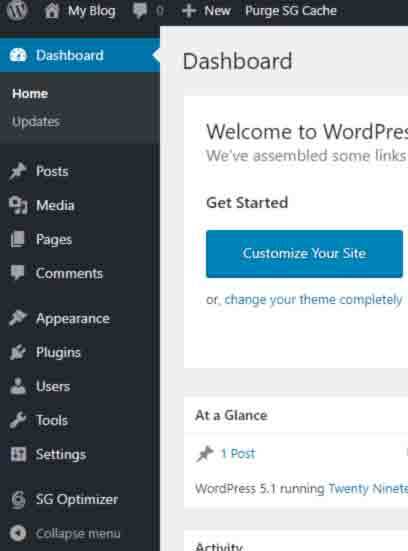 Installing WordPress (“foundation and framework”). Don’t be afraid, today it is easier than ever and I guide you through the process in the next step. The cPanel area is where a lot of the technical settings concerning your web space can be configured. First time I saw all the options I got overwhelmed. Good news is: to get your blog up and running you actually only need the WordPress Autoinstaller. Later you might want to come back for specific tasks like a setup of an email address (e. G. yourname @ yourblog . com and/or hello @ yourblog . com). “Choose Protocol” -> change either to https:// or https:// www. Depending on if you want your blog visitors to see “https:// yourblog . com” or “https:// www . yourblog . com” in their browser’s url bar. By choosing https your blog can be accessed in a more secure way (https = “secure” http). In today’s age, this is even SEO relevant (= relevant for your blog ranking on search engines like Google). If you get a warning if choosing https, then go with http:// or http:// www. for now. You can switch later to https by installing a security certificate, which is easier to do than it sounds using the cPanel, and switch your blog to https. “Site Name” -> The name for your blog. For lillaliptak.com it is “Lilla Liptak”. “Site Description” -> the description of your blog. For lillaliptak.com it is “Personal Development”. “Admin Username” + “Admin Password” -> you will soon use these to log in to your WordPress backend. Thus consider changing at least the name so you can better remember it. Could be your full name without spaces. Since you will need the name and password in a bit remember it or write it down somewhere safe. “Admin Email” -> add an email address you can access. This can be changed later if required. It will be used by WordPress to send you important notifications like a completed auto update. You do not need any of the offered plugins below the “Select Plugin(s)” section -> You can install them any time later if you want. If any plugin is preselected I recommend removing the selection. “Wordpress Starter” -> deselect this option. It provides a WordPress wizard by Siteground the first time you log in to your WordPress backend. However, you will not need it. Create a bookmark for each. Check out your blog’s homepage first. 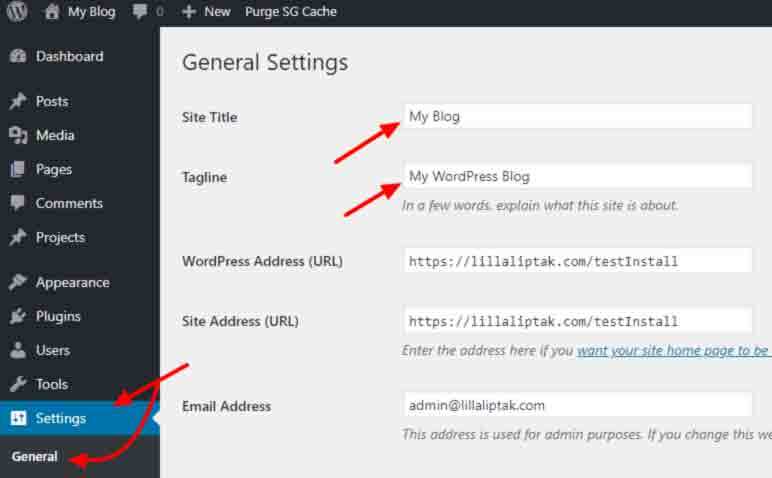 Next login to your WordPress backend: follow the link ending with “/wp-admin”. A login page appears. To log in use the name and password you chose during the installation. The left sidebar is the main navigation inside your backend. From here you can reach areas to install a theme (Appearance -> Themes), install plugins (Plugins -> Add New) or just configure your blog (Settings). Your theme and plugins might add new menu entries like the “SG Optimizer” plugin which is preinstalled on Siteground WordPress installations. You will come back here later when installing your theme. But for now: Congratulations: you have successfully installed WordPress! Next step: get your blog theme (Divi). There are as many themes as stars in the sky. The quality of the themes varies greatly and while some themes are “multi-purpose”, some have very specific use cases. Because I intended this post to be a quick & easy guide I will not go into details about theme differences. Instead, I will show you how to get the popular Div” theme and install it. There are other popular multi-purpose themes like Avada. But since I use and like Divi the most and am most familiar with it I chose it for this post. The license options you have are simple and only differ in the payment model. Both got the same functionality. 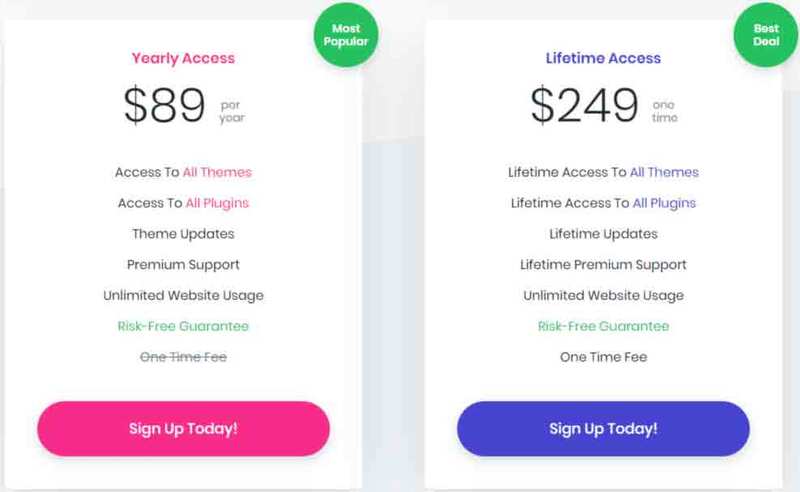 Therefore if you can imagine using Divi about more than 2 and a three-quarter year then I would go with the “Lifetime Access”. Click “Sign Up Today!”, fill in your information and submit the order. Time to install and use it. I will show you how to in the next step. 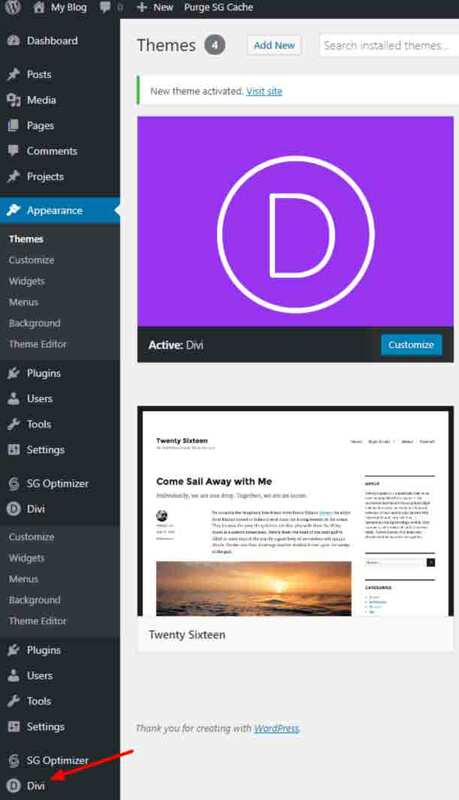 After you have bought a Divi license in the last step now you can install the theme. 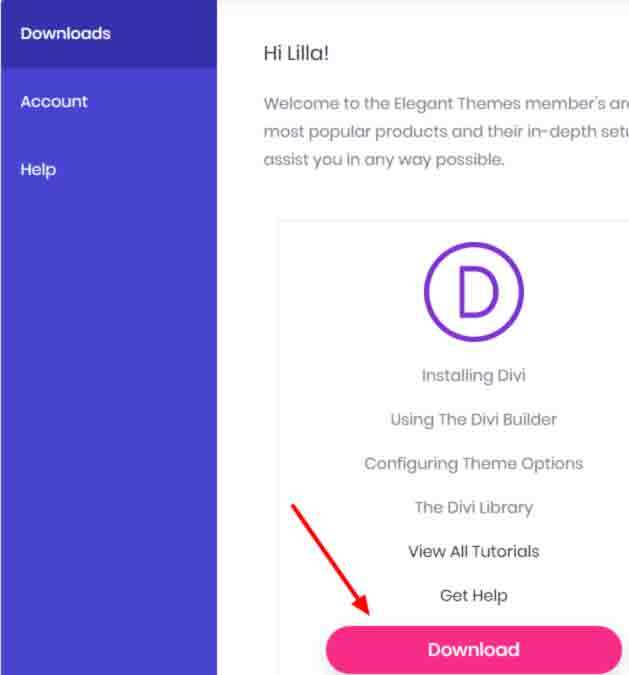 Divi itself offers an installation guide. Afterward, the “Install Now” button is no longer grayed out. Whenever you are ready: click it! Enter both and click “Save Changes”. Now hover over “My Blog” in the top navigation bar and click “Visit Site” to open your blog. 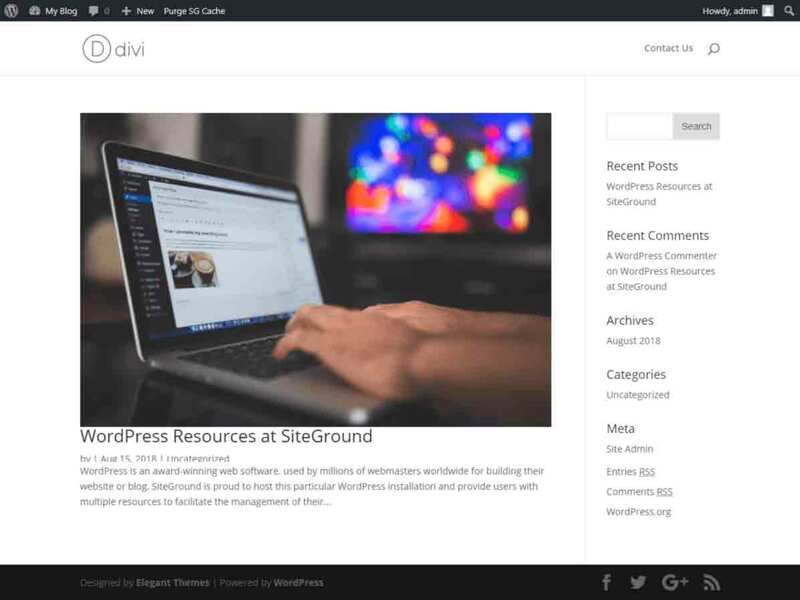 You should see the default Divi homepage: Just to clarify: the top bar with buttons like “My Blog” will not be visible to any visitor – you just see it because you are logged in into your WordPress. There are many WordPress and Divi settings to configure and before you get lost in all the options continue with the next step where I show you the most important settings to start with. There are many WordPress and Divi settings available to configure to your whims and needs – too much to cover them all in this step. Fortunately, most settings are fine (at least for the beginning) and there is good and comprehensive documentation by both WordPress and Divi available. However the documentation can overwhelm in the beginning and in the case of settings barely offer guidance on which settings are more important than others, especially when starting a blog. 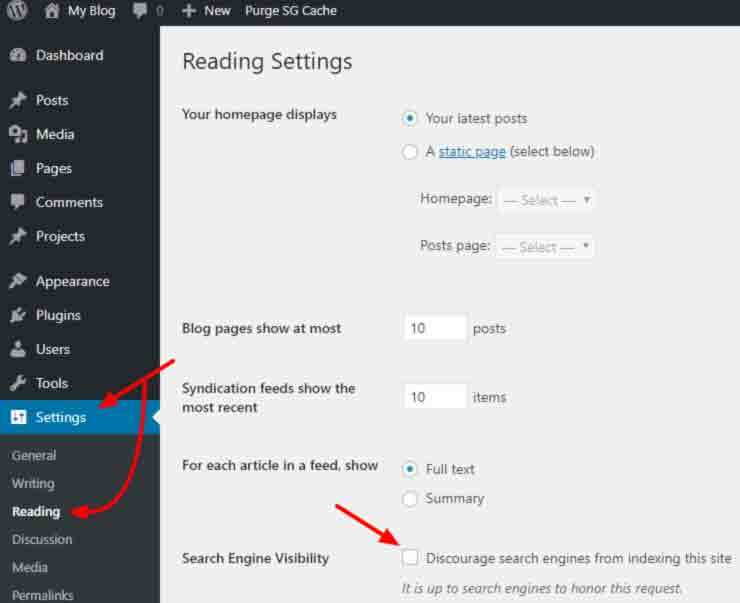 While some settings are relevant only for a few blog owners, others are important no matter what your site is about and contains. In this step, I will show you options and settings I recommend to start with. Otherwise, most search engines like Google or Bing will not list your blog within their search results. I hear you: “What is a favicon”? Quoting WordPress: “Site Icons are what you see in browser tabs, bookmark bars, and within the WordPress mobile apps” (you can see this if updating your favicon via the “Theme Customizer”). A favicon image needs to be a square. WordPress also recommends the dimensions to be 512px in width and height. The same overlay to upload an image file like in the previous step to upload a logo appears. Follow the same steps as for the logo: select a file for upload and upload it, change “Title” and “Alt Text” for the favicon (e. G. “[name of your blog] favicon” -> “Lilla Liptak favicon”), click the blue “Select” button. Don’t forget to click the blue “Publish” button at the top of the theme customizer sidebar. To add links to your social media profiles or remove any of the icons hover over “Divi” in the sidebar and then click “Theme Options”. Just use the switches and add links as you like and click the “Save Changes” at the top of the theme options. Go to the next step to reflect and celebrate! 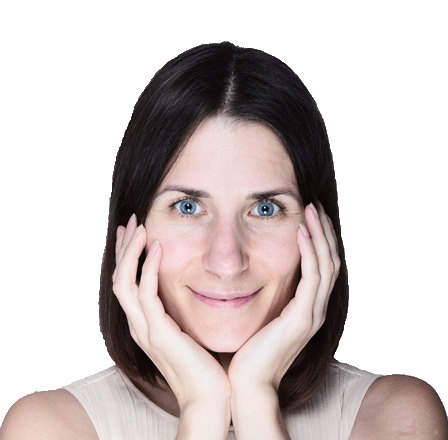 You now have a functioning blog which you can fill with content and improve from here :-)! Some of the above topics might be covered on my blog in the future – so stay tuned if you liked this article and want to proceed with your own blog business!